"Arctic sea ice is disappearing on a pace and magnitude unlike anything the Earth has experienced in the past 1,450 years, according to a Canadian-led study published Wednesday in the leading science journal Nature. The amount of sea ice in the Arctic has been declining continuously for the past four to five decades — and is now some two-million square kilometres smaller in area than it was in the late 20th century. But until this study, spearheaded by researchers Christian Zdanowicz and David Fisher from the Geological Survey of Canada, it remained unclear whether these losses of recent decades were out of line with natural fluctuations of the past." The Arctic Ice is melting at an unprecedented rate according to an article in Nature but, gee, it is still unclear whether man made environmental factors could be involved or whether "it's gotta be genetic" ... er ... "natural variation". Oh wait we are not talking about unprecedented, even startling increases in autism disorders are we? 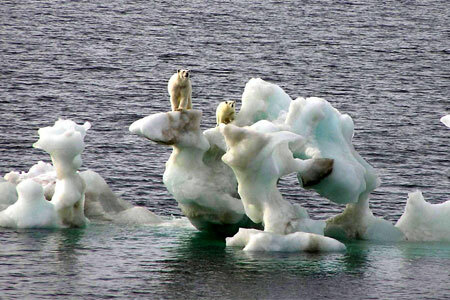 No, this is arctic ice melting more and more quickly. Let's take another half century and talk some more about how we can't be sure it isn't just "natural fluctuation". Science takes time and we've got unlimited amounts of time right? No word yet on whether recent Nature contributor and high functioning autism activist Laurent Mottron has confirmed that the arctic ice melt is a natural evolutionary advance, an advantage, not an environmental calamity.